Introducing a second chiral center on the previously described 1,2,4-triazole, allowed us to increase diversity and elongate the ‘C-terminal part’ of the mol. 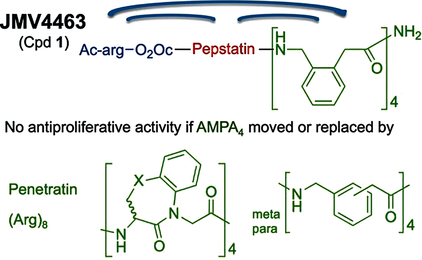 Therefore, the authors were able to explore mimics of the substance P analogs described as inverse agonists. Some compds. presented affinities in the nanomolar range and potent biol. activities, while one exhibited a partial inverse agonist behavior similar to a Substance P analog. Modulators of the serotonin 5-HT6 receptor (5-HT6R) offer a promising strategy for the treatment of the cognitive deficits that are assocd. with dementia and Alzheimer’s disease. 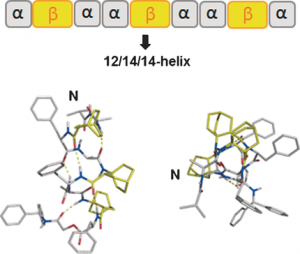 Herein, we report the design, synthesis, and characterization of a novel class of 5-HT6R antagonists that is based on the 1H-pyrrolo[3,2-c]quinoline core. The most active compds. exhibited comparable binding affinity to the ref. compd., SB-742457, and markedly improved selectivity. Lead optimization led to the identification of (S)-1-[(3-chlorophenyl)sulfonyl]-4-(pyrrolidine-3-yl-amino)-1H-pyrrolo[3,2-c]quinoline (14) (Ki = 3 nM and Kb = 0.41 nM). Pharmacol. characterization of the 5-HT6R’s constitutive activity at Gs signaling revealed that 14 behaved as a neutral antagonist, while SB-742457 was classified as an inverse agonist. Both compds. 14 and SB-742457 reversed phencyclidine-induced memory deficits and displayed distinct procognitive properties in cognitively unimpaired animals (3 mg/kg) in NOR tasks. Compds. 14 and SB-742457 were also active in the Vogel test, yet the anxiolytic effect of 14 was 2-fold higher (MED = 3 mg/kg). Moreover, 14 produced, in a 3-fold higher dose (MED = 10 mg/kg), antidepressant-like effects that were similar to those produced by SB-742457 (MED = 3 mg/kg). Together, these data suggest that the 4-(pyrrolidine-3-yl-amino)-1H-pyrrolo[3,2-c]quinoline scaffold is an attractive mol. framework for the development of procognitive agents. The results are promising enough to warrant further detailed mechanistic studies on the therapeutic potential of 5-HT6R antagonists and inverse agonists for the treatment of cognitive decline and depression/anxiety symptoms that are comorbidities of Alzheimer’s disease. A single tool for early detection, accurate staging, and personalized treatment of prostate cancer (PCa) would be a major breakthrough in the field of PCa. Gastrin-releasing peptide receptor (GRPR) targeting peptides are promising probes for a theranostic approach for PCa overexpressing GRPR. However, the successful application of small peptides in a theranostic approach is often hampered by their fast in vivo degrdn. by proteolytic enzymes, such as neutral endopeptidase (NEP). Here we show for the first time that co-injection of a NEP inhibitor (phosphoramidon (PA)) can lead to an impressive enhancement of diagnostic sensitivity and therapeutic efficacy of the theranostic 68Ga-/177Lu-JMV4168 GRPR-antagonist. Co-injection of PA (300 μg) led to stabilization of 177Lu-JMV4168 in murine peripheral blood. In PC-3 tumor-bearing mice, PA co-injection led to a two-fold increase in tumor uptake of 68Ga-/177Lu-JMV4168, 1 h after injection. In positron emission tomog. (PET) imaging with 68Ga-JMV4168, PA co-injection substantially enhanced PC-3 tumor signal intensity. Radionuclide therapy with 177Lu-JMV4168 resulted in significant regression of PC-3 tumor size. Radionuclide therapy efficacy was confirmed by prodn. of DNA double strand breaks, decreased cell proliferation and increased apoptosis. Increased survival rates were obsd. in mice treated with 177Lu-JMV4168 plus PA as compared to those without PA. This data shows that co-injection of the enzyme inhibitor PA greatly enhances the theranostic potential of GRPR-radioantagonists for future application in PCa patients.